It started out as just fun and games. A publicity hungry mogul playing the role of a cold, ruthless mogul. It soon turned very ugly: this is what happens when the twisted reality of celebrity culture and realty tv infiltrates the landscape of American politics, unimpeded. It began when the TRUMPIAN, “You’re fired,” a somewhat tongue-in-check game of executive moxie, transformed itself into a frightening brand of authoritarianism and mind control that rivals nothing we have seen since the fascist regimes of World War II. This lethal confusion between the supposed innocence and “lovely illusion” of reality television, and high-stakes political campaigning, has reared its terrifying and destructive head: culminating just yesterday in the violent closure of a TRUMP rally in Chicago. We have already seen how the narrative contruction of reality tv attempts to mimic the spontaneity and authenticity of everyday life. The TRUMP campaign plays this dynamic out in reverse: whatever authenticity may still exist in American politics is now undermined and confused by the fabricated and highly manipulative dramatics of made-for-television. Life imitating art. Within the bubble of confusion that lies in the blurring of reality and fiction, TRUMP exerts a degree of control that is reminiscent of the oratory spectacles of Hitler and Mussolini. 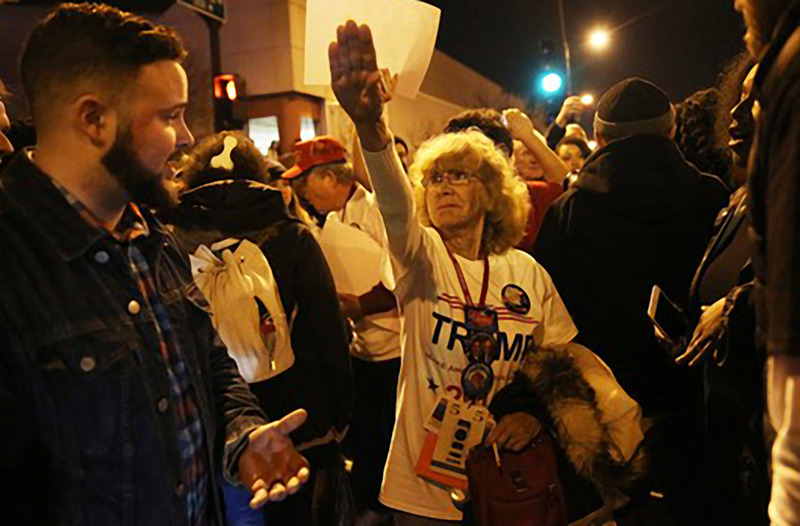 Just the other day, TRUMP asked his audience to “pledge allegiance” to his campaign invoking the intoxicated mass Nazi rallies of the 1930s and 1940s. It is the same whipped up, delirious roar of the crowd, the raised salute, the rhythmic chant, all under the hypnotic spell of the charismatic demagogue who knows no boundaries. TRUMP did not construct this level of control and manipulation out of nowhere: it is a finely crafted technique honed over years of playing the role of a corporate demagogue on the Celebrity Apprentice. But his fans and followers never saw the transition, they never saw it coming, they have never been able to differentiate between TRUMP the performer and TRUMP the politician, they are one and the same. In essence, he has mastered the power of the “lovely illusion,” the erosion of authenticity, the seduction of the post reality, in which there is no longer separation between that which is real and that which is not. Now TRUMP is working his total control of the Republican party and soon he will attempt to exert his post real demagoguery over the entire political system. This is an illusion that goes very deep: far, far beyond the suspension of disbelief.